Squirt toilet cleaner around the sides and rim. Scrub the bowl with a toilet brush. Soak: give the disinfectant some time to work before scrubbing again, this time focusing on underneath the rim and the u-bend. 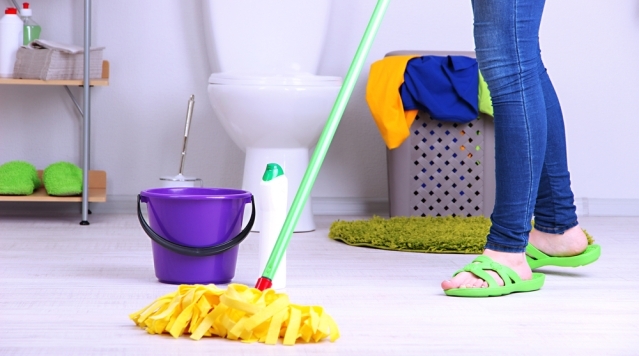 We all have busy lives, and sometimes cleaning the toilet is the last thing on the list! But with all the bacteria, stains and odours that come with frequent use, a clean toilet is really important for the health of your household. Give it some regular care and attention and the toilet doesn’t have to be the stuff of nightmares. Here’s how to kick-start your toilet cleaning routine. Select the right cleaning supplies. The standard toilet cleaner is chlorine bleach or a commercial disinfectant containing bleach liquid. These are often scented to help freshen up the air in the bathroom, but the disinfectant itself should effectively eradicate all toilet odours. Limescale removers and powders containing strong cleaning agents like borax can be found at your local store, too, and are good for performing a deep-clean, or for tackling particularly persistent stains. Domestos Zero Limescale is a good choice for persistent limescale stains in the toilet. Toilet brushes with plastic bristles or non-scratch scourers are better than ones made of metal as these can damage the toilet surface. Some people have reusable cloths for the toilet exterior, but it’s more hygienic and convenient to use disposable wipes or paper towels with a cleaning spray, so you can throw them away afterwards. Finally, always wear protective clothing when dealing with bleach or other toilet cleaners. Also remember to move any bathroom supplies or mats away from the toilet so that you don’t splash them, and be sure to open the window to ventilate the bathroom. Then you’re ready to start! To get rid of all stains in the toilet bowl, you will need access to the whole surface, so start by turning off the water valve for the toilet, and then flush it to reduce the water level. Lift up the toilet seat and squirt your toilet disinfectant around the rim and sides, letting it dribble down the bowl. Scrub with a toilet brush, spreading the liquid all around the bowl as you go. Set aside the brush and leave the disinfectant to work. In the meantime, shut the lid and get your anti-bacterial spray and disposable paper towels ready for the outside of the toilet. Clean around the tank, hinges, all the parts of the toilet seat and the base as well. Remember to lift up the lid and spray both sides of the seat, as this area can be a key source of lingering odours. Grab your scrubbing brush again and give the toilet bowl a second scrub, focusing on key areas like underneath the rim and down into the u-bend. When finished, flush the toilet, using the fresh water to clean off the toilet brush. For heavier limescale deposits, take a wet pumice stone and gently rub the area, taking care not to scratch the enamel. Then step back and admire your handiwork! The toilet should be gleaming by this stage, with a much more pleasant smell. Vinegar is a useful soaking agent for both odours and stains. Pour approximately 3 cups into the toilet bowl, taking care to cover as much of the sides as you can and then scrubbing with your toilet brush. A couple of cups of vinegar in the toilet every month can actually prevent limescale stains from reoccurring. Cola could also well on dirty toilets, as the acids in the drink kill bacteria and the fizzy bubbles help to break down limescale deposits. Pour the liquid around the rim and into the bowl and leave for an hour or overnight if you can. Note: These methods can effectively combat toilet odours, but they may not produce the desired smell that you’re looking for, so you might want to add in some air freshening spray afterwards. The best way to control toilet stains and odours is through day-to-day maintenance. Leave the toilet brush soaking in some soap solution or diluted toilet cleaner so you always have it on-hand for a quick scrub. Place some disposable wipes on top of the tank, follow the steps above for a regular clean, and it will be easy to keep your toilet looking and smelling fresh!